Didn’t read as much as I’d like due to editing deadlines, but I still went through a couple. 1. Only Ever Yours – Louise O’Niell. A dystopian future similar to The Handmaid’s Tale. I can see why it’s gotten so much attention, but it didn’t quite work for me. I’d try another book of hers, though. 2. The Mirrored World – Debra Dean. Historical fiction set in Russia around Catherine the Great’s time. I enjoyed it but certain aspects felt glossed over. 3. The Shining Girls – Lauren Beukes. Been meaning to read this for ages after really enjoying Broken Monsters. It was a creepy, enjoyable thriller starring a time travelling serial killer. 4. Fool’s Assassin – Robin Hobb. Re-read in anticipation of Fool’s Quest being out this summer. I want to read the sequel so badly it pains me. 5. 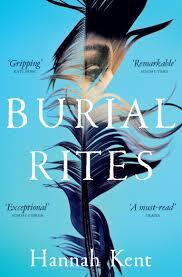 Burial Rites – Hannah Kent. A story of a woman sentenced to death for murder in Victorian Iceland. Well-researched and written, and unsurprisingly, a sad read. 6. The Innovators: How a Group of Hackers, Geniuses and Geeks Created the Digital Revolution – Walter Isaacson. Partly book research, partly general interest. A good overview. Total books so far in 2015: 31.